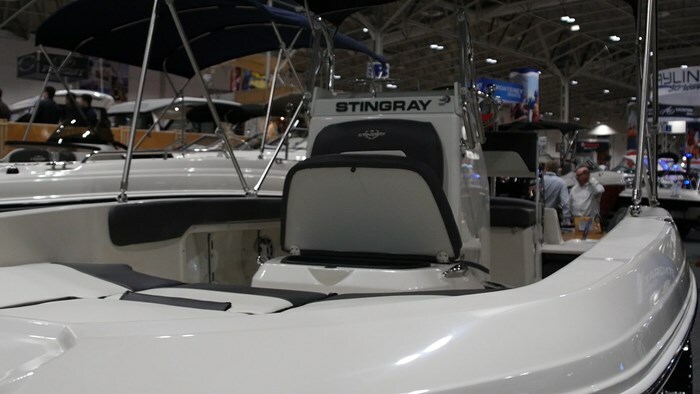 Stingray Boats, built in Hartsville, South Carolina has a strong reputation for building quality, sport runabouts and cuddy cabins. Recently they entered into the growing popularity of the deck boat market. 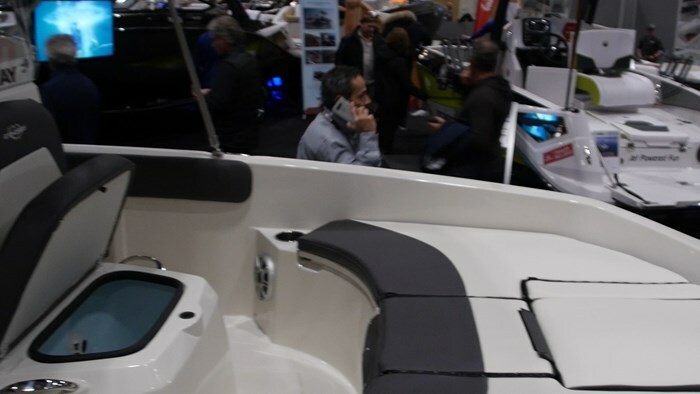 They offer a full line of outboard deck boats and for 2017 they added a couple more models to the growing deckboat family and I got to take a look at the newest at the Toronto Boat show. 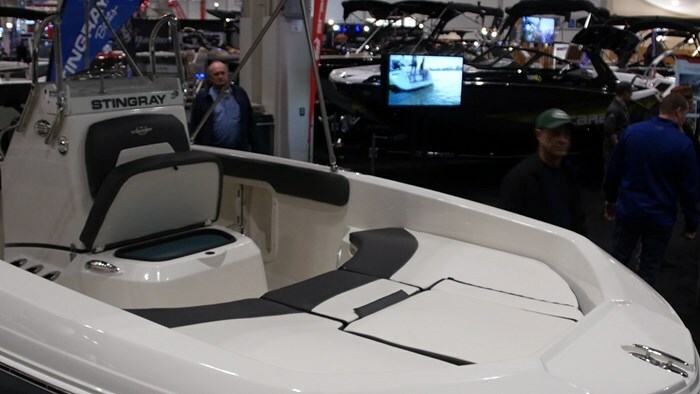 Upon first glance of the 186CC, you’re going to think this boat would be classified as a fishing boat, but it is first and foremost still a deckboat. Think of it more as a fishing boat and family deckboat all rolled into one. And as we spend more time looking at the features of this boat you will see what I am talking about. At a hair over 19-feet long with a 90-inch beam the 186CC boasts a dry weight of just 2300 pounds, right away this makes it a manageable package to tow behind a light duty truck or SUV. It was even on display sitting on a single axle trailer. 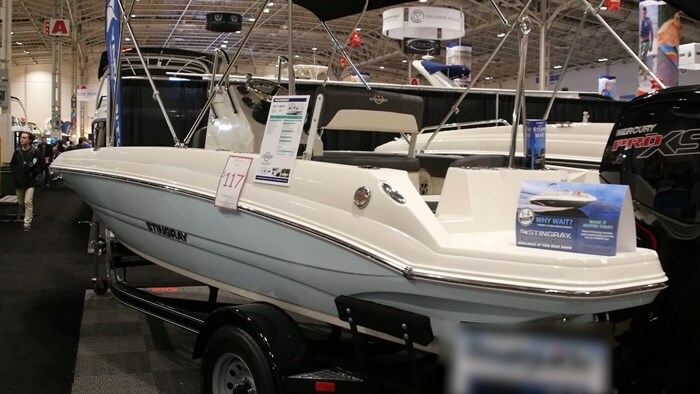 This boat will make a great cottage runabout, but also this is great to know it would also be perfect to trailer from lake to lake and with a swing away tongue, could fit into most garages. On display with a white hull and deck with a soft blue hull stripe, the 186CC features a subtly sweeping sheerline along with style lines built into the hull sides that give it a sporty look. It also has a low profile look that will help again with fitting it into a garage. Entering the cockpit is made easy by stepping onto either one of the platform extensions that wrap around the outboard motor. It’s tough to create a swim platform with an outboard powered boat but they do a great job with what they have. 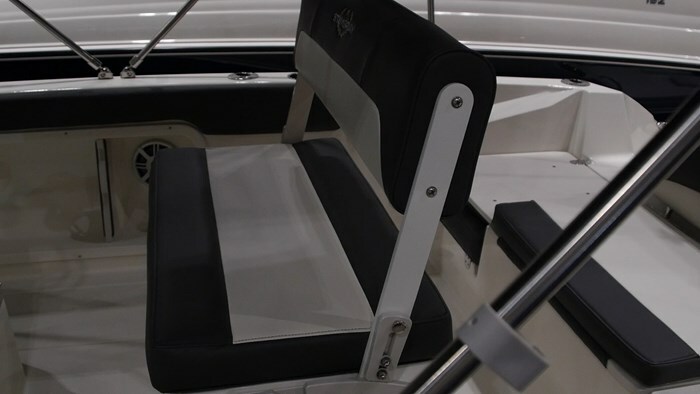 There is a transom walk through on each side of the boat allowing you to get in easily as you step onto what are actually jump seats. There is a decent sized rear bench seat with backrest and on each side of it you will find flip up jump seats. This starts to show that this boat is built for both fishing and family. You can fish back here or you can flip up the seats and go cruising. Staying at the transom, there are cupholders and rocket launchers for rods. Dedicated rod storage is located in each of the gunnels, along with coaming bolsters and speakers. Passageway around the center console is easy even though the 90-inch beam isn’t massive by industry standards. Stingray does a great job making the most use of the space is has. The console and helm seat are nicely appointed and quite functional. That seat can be used either as a seat itself or a leaning post, as that back rest can be positioned either fore or aft. What I like on this boat compared to others is that on some center consoles they mount the seat too high, so if you want to sit on it you have to hop up. I like that on the 186CC you can sit down onto the cushion, and if you want to lean, you can do so against the backrest. This makes it a seat first, and leaning post second. 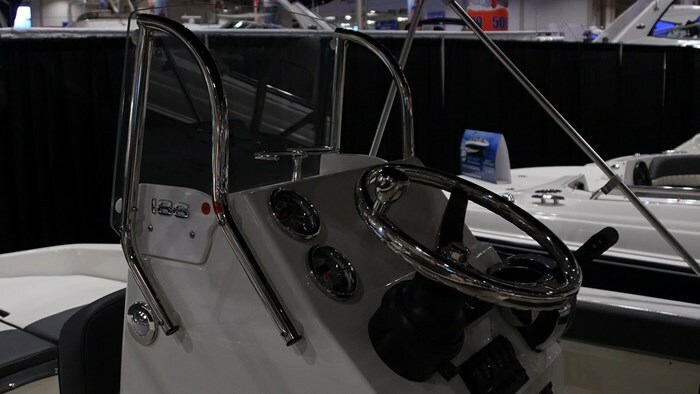 The console features a stainless steel wheel and grab handles and is nicely appointed. Controls are right at hand, you have clear view of your gauges and cup holders are right in front. There is space to mount up to a 10-inch fish graph and access to the wiring is easy since the whole console hinges open. Stand up rod storage flanks each side of the console, good for 3-rods each and there is a seat forward of the console, complete with grab handles. There is a blue tinted optional livewell under that seat. The blue tint is a nice touch that comes from larger center console offshore boats that are also found in the Carolina area. The bow on the 186CC is really where this boat pulls double duty. 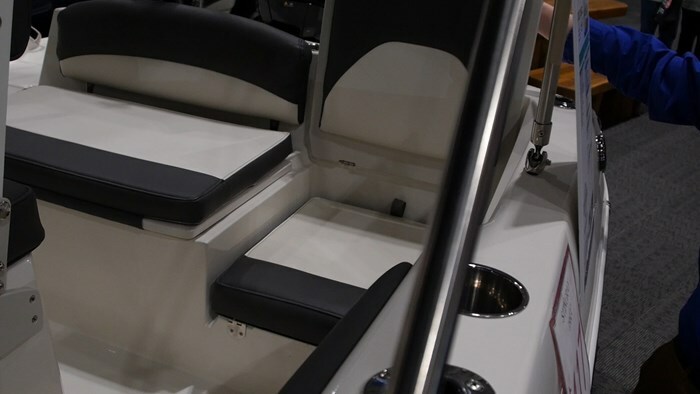 There is a large bow casting deck that also features a seat base and the option for a bow trolling motor for when fishing is the task at hand. It’s a great size and the low profile design of the 186CC will be great for getting those catches into the boat fast. When it’s time for family fun you can cover the entire deck with cushions giving you an awesome bow sundeck. It’s spacious enough to lay out to read or take a nap, but also a decent size for people to sit up there while running. I would say my only criticism is the placement of the bow grab handles being a little awkward as they were placed lower, closer to the floor. I think by mounting them a little higher by the topsides you’ll have people use them more, increasing the safety factor. But all in all this boat was quite impressive. It’s a fun and sporty package that will be best suited for hopping lake to lake and seeking adventures with family and fishing gear.